Time for your daily dose of derelict trucks rusting in their final resting place. Today's entry comes from Dave Clark. 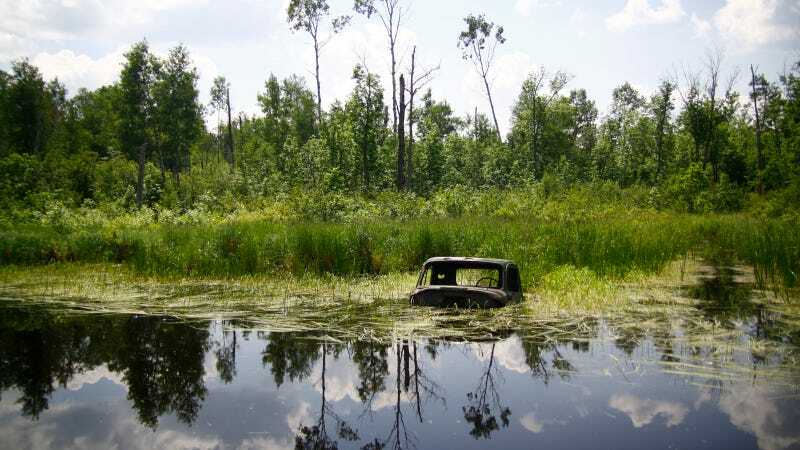 He spotted what he identifies as a "1950's truck" in a swamp of Manitoba's Whiteshell Provincial Park when he was a kid, and returned almost two decades later to find it again and get a photo. With pretty much only the top of the cab visible, it's a tough one to place. But I have faith in the Truck Yeah!/Jalopnik brain trust, leave your assessments of what this cab's from in the comments! Then read the story of Dave's trip to find the old rig on his blog, TravelDriveRace. Rust In Peace is a daily feature on Truck Yeah! that takes a moment to respect retired trucks as they return to the Earth. If you've seen one you think we should share, drop a note to tips@jalopnik.com! Hat tip to Dan O!